We fly. We drive. We create pollution. We toss a half-full bottle of hotel shampoo. We add to the landfill. We have the hotel staff change our still-clean sheets. We waste precious water.As more travelers and people in the travel industry are starting to recognize, if we’re going to continue to explore the world at our current pace we need to become more conscious of the effect our travels have on the world. It’s no longer just a nice thing to do. It’s essential, say some travel experts. 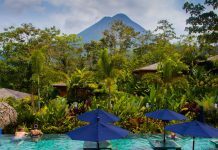 “Guests are starting to demand it,” says Patricia Griffin, president and founder of the Green Hotels Association, a 15-year-old trade association with more than 300 members. And the industry is listening. Many hotels, inns, resorts and other accommodations have stepped up to the plate, environmentally speaking. Though automobile rental companies are offering hybrid cars, and some flight programs are offering “carbon offset” plans that plant a tree every time you fly, it’s the lodging industry that has come up with the most creative and ingenious ideas for protecting the environment. Hotels that only offer to not change your bath towels and sheets daily are so far behind the curve, they’re practically archaic. Many new and innovative ideas have far surpassed that initial effort – which isn’t to say it shouldn’t still be done. In fact, guests are starting to expect hotels to do their part, she says. Customers asking about “green” practices have surged in recent years. But how much is lip service and how much is reality? One resort – the Lodge at Whitefish Lake in Montana – not only talks the talk, but walks the nature walk. A controversial proposal for a major housing development was averted when the lodge’s owners, Dan Averill and his sons, purchased the 37 acres. About six of those acres soon will be developed into low-density housing and one acre will be used to expand the lodge. The new owners donated the other 30 acres, known as the Wisconsin Wetlands, back to the Whitefish Lake Institute to be preserved as a natural area. The Averills also pledged $110,000 toward the restoration of the wetlands area. The “green” movement in the lodging industry began with baby steps. Travelers might have first noticed it at national parks. Perhaps they saw soap and shampoo dispensers in bathrooms instead of tiny disposable bottles. Recycle bins began making their appearances in public spaces. Xanterra Parks and Resorts operates lodges in many of the nation’s parks, including Grand Canyon and Yellowstone, and has won numerous awards for environmental excellence. Xanterra’s programs include on-site renewable solar photovoltaic energy systems and a groundbreaking effort to recycle campers’ propane tanks. It’s this kind of innovative effort that has netted Xanterra numerous environmental awards. But in the past seven or eight years, the industry has stepped up its part in the battle for a cleaner earth. He’s the first to admit it is, in a good way, self-serving. “What’s good for the environment is also what’s good for our parks, and for our business,” he says. “Who wants to work for a company that spills oil and pollutes the earth? The King Pacific Lodge has reduced its carbon footprint by half by instituting a few new procedures. The resort, a floating island, is towed annually to its site just off the Great Bear Rainforest near Vancouver in British Columbia. It is reachable only by air and water. To offset the carbon-creating travel required to get there, the lodge is installing a river-hydro plant and solar panels to meet its power needs. It also only uses suppliers who conduct their own programs of carbon reduction. The Hamilton Park Hotel in Florham Park, N.J., participates in the “New Jersey Wheels” program, which helps employees find shared rides to work. Used soap is not thrown away during a guest’s stay; it gets wiped off and left for further use. More than 5,000 light bulbs have been replaced with fluorescent bulbs and motion sensor lights have been installed in general areas. Tarrytown House Estate in New York dug a well on its property. It supplies water for the hotel’s landscaping. They’ve installed motion-sensitive thermostats in rooms so that heating and cooling is not in heavy use when rooms are empty. Water coolers are installed in meeting rooms and all paper left behind from meetings is shredded and recycled. Proximity Hotel, being constructed in Greensboro, N.C., has raised the bar on “green” construction. The hotel uses 100 rooftop solar panels to collect solar energy; it recycled 75 percent of its construction waste; to conserve water, it is capturing rainwater to irrigate the gardens; it uses only 45-55 percent of the energy consumed by a conventional hotel. And, to top it all off, the hotel is restoring 700 linear feet of a stream on the property. Jackson Hole Mountain Resort in Wyoming uses wind, geothermal, biomass and hydropower to operate – equivalent to planting more than 5,000 trees over a period of three years. It also offers bus passes for employees who need to get to the resort, so they don’t have to drive their own cars from town. It spends more than $85,000 a year on the bus passes. Vermont’s Inn at Mount Snow, which opened in 2006, installed just about every “green” practice a hotel can offer. It uses eco-friendly cleaning products, fluorescent bulbs, recycled paper products (such as notepads), in-room recycling bins, low-flow showerheads and toilets, and motion detectors in public spaces to determine the need for air conditioning or heating. Kona Village in Hawaii is over the top when it comes to recycled materials. The roofs of its restaurant, fitness center and bungalows are made from the dried fronds of coconut palms found on the property. Ceiling fans eliminate the need for air conditioning and there are no radios, televisions or telephones in the rooms. Kimpton Hotels has its Earthcare program, which it practices in all 42 of its properties and includes using (as many hotels now do) environmentally safe cleaning products, soy ink and recycled paper in its offices, and water-saving bathroom fixtures, among other things. Devil’s Thumb Ranch in Granby, Colo., uses geothermal radiant heat in all of its new buildings. Its fireplaces are all EPA-approved and only environmentally sensitive cleaning and spa products are used. Le Meridien Hotel on Bora Bora has an established turtle sanctuary. Jumby Bay in Antigua also provides a safe haven for the endangered creatures. The White Barn Inn in Kennebunkport, Maine, keeps auto emissions down by shuttling guests from place to place in small electric cars. The Hotel Monaco in Denver donates all partially used bath amenities to a local women’s shelter. Besides recycling and other in-house programs, the hotel donates $10 of every night’s stay to the Trust for Public Land. Nomadic Expeditions’ Three Camel Lodge in the Gobi Desert is fully powered by wind and solar energy. The list is virtually endless. New ideas and creative solutions are coming all the time and hotels seem eager to out-do one another, making it not only easy to be green, but easy to stay green. Walk when possible, or use public transportation. Instead of renting a car, use the hotel van or other available transport. Share a taxi or rent a bike. If you need a car, rent a hybrid, if possible. 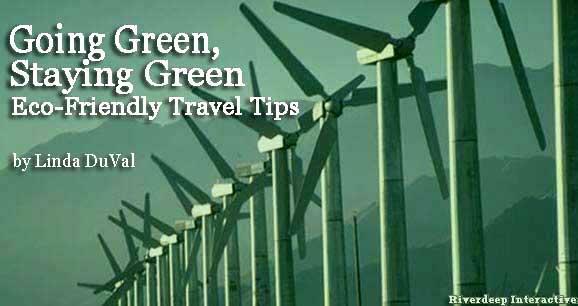 When booking lodging, ask the hotel if it participates in “green” practices. If nothing else, it will become aware that being green is important to guests and may initiate some practices. Take a shower, which generally uses less water than a bath. Turn off (or minimize) the air conditioning or heat when you’re not in your room. Turn off lights and televisions before you leave. Close the drapes. Participate in hotel recycling programs. Rewrap your bar of soap in the hotel bathroom so housekeepers know you want to continue using it. If your hotel provides new soap daily anyway, take the soap home for later use. Leave unopened bath amenities at the hotel; take home partially used ones. Encourage your hotel to refill the little bottles instead of discarding them. Take only brochures and maps you really need from information stands and offer to share them with others. Don’t purchase gifts that come from endangered sources, such as ivory, feathers, turtle shells or animal skins. Use a digital camera. Disposable cameras create waste. Linda DuVal is a freelance writer in Colorado Springs, Colorado.